I asked about the focus on the project over the person behind it, and whether she thought that was a risk. Michelle had no qualms, though: KoolProjects gives people a place to showcase their passion, something desperately needed. Facebook requires that you know the person already in order to access their content. 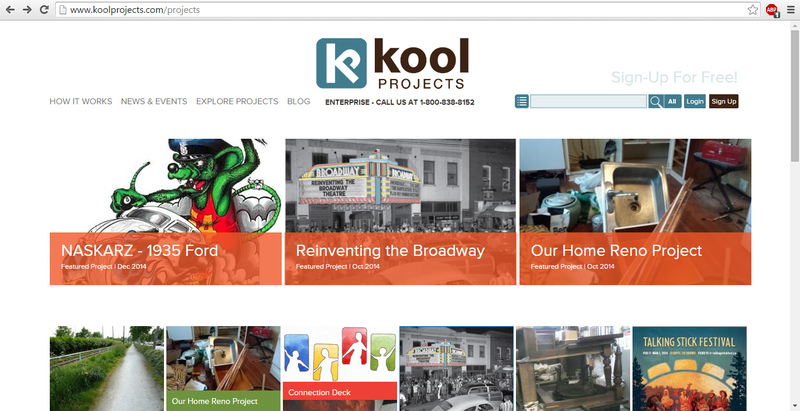 KoolProjects will allow you to search by project type, rather than the person behind it. (It has since occurred to me that if users are not using KoolProjects to convey personal information, the sort of security protocols associated with Facebook aren’t necessary; this means that KoolProjects, much like Flickr, doesn’t have the same issues with searchability that something like Facebook might.) Of course, once you have found a project, you can get to know the person behind it, she said. For instance, with a paid membership you can have multiple public projects all linked through your profile. The person isn’t irrelevant, then, but their projects are both the focus and the entry point. In terms of revenue, KoolProjects is currently focused more on growing users than making profit; there is currently some advertising, and paid memberships confer certain options that free memberships do not. In the future, there will be options for buying and selling finished projects through the platform and ordering photobooks, both of which will contribute to KoolProjects’ revenue stream. Thinking about the examples Michelle mentioned, I suggested that what counts as a “project” might be wider than she had been thinking. After all, users often find uses for social media that the designers hadn’t anticipated. That reminded Michelle of a grant agency that approached them; the agency is considering making KoolProjects a mandatory component of the grant recipients’ work, so that the agency can keep tabs that the restoration work is coming along rather than relying on infrequent scheduled updates. In general, KoolProjects could be helpful for users looking to keep themselves accountable, transparent, or communicative. Besides more options for generating revenue, KoolProjects is also looking to develop a discussion section attached to projects over which the users have moderation privileges; Michelle says this should help generate engagement with the project and keep interest high. KoolProjects has also built an enterprise solution for government, corporations and schools that have larger projects. KoolProjects has recently secured its first pilot project in collaboration with the Richmond School District 38, RMCP and Rick Hansen. This particular project will be private as it will be used for Grade 12 Students and is FOIPPA (Freedom Of Information and Privacy Act) compliant which allows schools, colleges and universities to use the platform for their students. If you have any questions, you can contact KoolProjects directly or you can send the questions to me and I will pass them on to Michelle. Also, feel free to think out loud in the comments: I think there are lots of ways this platform intersects with some of the things we’ve discussed in class that I’ve barely touched on (identity, revenue, measures of success, unexpected affordances, emerging platforms). I was not in any way paid to write this review, nor given any compensation by KoolProjects or its affiliates. *Traditional artist is an industry term for people working in physical materials—paint, sculpture, etc.—as compared to a digital artist, who uses software like Photoshop to create images. At least, that’s how my brother and his friends, all professional artists, use the terms. Mollineaux, Michelle. “Interview.” Message to the author. 20 February 2015. E-mail. Mollineaux, Michelle. Personal interview. 20 February 2015. Mollineaux, Michelle. “RE: KoolProjects – Blog.” Message to the author. 15 March 2014. E-mail. This entry was posted in Identity, KoolProjects by Christian Hendriks. Bookmark the permalink. Ha! I know Michelle. Or at least I used to. I worked with her ages ago. Great piece, Christian. And….perhaps the focus on projects would appeal more to librarians and archivists. The enterprise solution we have at UBC Library is “Confluence” but the challenge is getting people to share. That is always the challenge in any work context.